A forlorn rag doll found in an Indianapolis attic was rechristened with the names of two of James Whitcomb Riley's characters to become Raggedy Ann. An icon for generations of American children, the character of Raggedy Ann boasts an impressive Hoosier pedigree. Legend surrounds the birth of the flame-haired rag doll, but a few facts are known. Raggedy Ann’s creator was Johnny Gruelle, a free-lance cartoonist and editorial illustrator for The Indianapolis Star , The Cleveland Press, and The New York Herald, in the first few decades of the twentieth century. 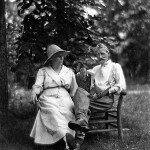 Born in Arcola, Illinois in 1880, Gruelle moved at age two to Indianapolis, where his father Richard Gruelle came to associate and exhibit with the Hoosier Group of painters. 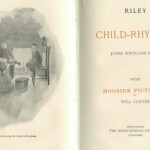 Richard Gruelle’s circle of friends included bestselling Hoosier poet James Whitcomb Riley. Decades later, Richard’s son Johnny turned to the family friend’s verse in naming a forlorn rag doll found in the Indianapolis attic of his parents’ home, combining “The Raggedy Man” and “Little Orphant Annie” to produce the name “Raggedy Ann”. After rehabilitating the doll’s features with a few strokes of his pen and a pair of buttons, the illustrator set about creating a story line for Raggedy Ann, initially to entertain his daughter Marcella. After Marcella’s tragically premature death, Gruelle threw himself into writing and illustrating the Raggedy Ann Stories, the first volume of which was published by P.F. Volland in 1918. Gruelle had simultaneously been designing a Raggedy Ann doll. After his prototype received final approval from the US Patent Office, the dolls went into production and were used in Volland’s promotion of Gruelle’s book. Publishing Ragged Andy Stories in 1920, Gruelle continued the saga of the red-headed ragamuffins through books and serialized newspaper stories until his death in 1938. Raggedy Ann and Andy dolls are still in circulation thanks to a variety of toy manufacturers and sewing patterns.